Walls fall into two basic types: Mortared walls may be constructed of brick, stone or concrete, with the gaps between the stones filled in by cement mortar for strength and durability. 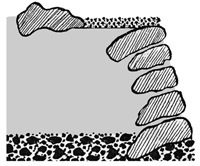 Dry walls are not mortared and are usually made of stones that have been carefully arranged in layers to lock themselves in place. Both kinds of walls can be either free-standing or they can be built against a bank of soil and serve as a retaining wall. 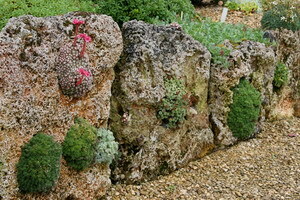 Mortared retaining walls may offer an opportunity for planting Rock Stars® just behind the wall top. 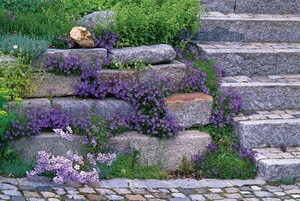 Plants with a cascading habit look particularly charming when draping from the top of a retaining wall. Among the most popular types for this purpose are the spring-flowering Aubrieta (Rock Cress), Arabis (Wall Cress) and perennial Alyssum (both Aurinia and Alyssum species). Old mortared walls may also have missing stones or bricks (you can use a hammer and chisel to create or enlarge these) or even large cracks that offer an opportunity for growing some Rock Stars® in a horizontal position. It’s just a matter of stuffing the holes with soil mix, cramming in some plants and remembering to mist these regularly while they get established and during drought. To help hold the soil in place, stuff it over carefully and tightly with sheet sphagnum moss after you cram in your plants. For larger cracks or gaps you can fabricate small “cages” from chicken-wire lined on the inside with sheet sphagnum moss and then stuffed with a soil mix. This is a super-picky project but the results are amazing and it beats just always scowling at those nasty cracks if your wall is in less-than-perfect condition. If you plan to build a dry stone wall, during construction you can pack some of the spaces between the stones with this same soil mix, carefully placing the plants in the crevices between the rock layers as you build – it’s much easier than trying to stuff in the plants later on. Plan to make the surface of your dry stone wall slope gently backwards, so each rock has a downward slope of around 10 to 15 degrees. This traps some of the natural rainfall, guiding it back between and behind the stones where your plants will appreciate the moisture. 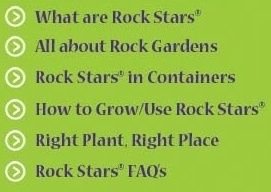 Most of our Rock Stars® will grow in walls, so long as there is a reasonable amount of soil for their roots. You can find the very best candidates by using our Advanced Search and clicking the box for Walls/Crevices listed under Plant Uses and Characteristics. In tight crevices between walls, don’t be afraid to first squash the rootball between your flattened palms in order to change its shape. So long as the roots stay intact, the plants will recover from this quickly. When attempting to stuff the plants into an existing wall, look around for some handy tools to help with this. The handle end of a kitchen knife or even a piece of dowel or a pruned branch about half an inch in diameter can work well for this task. Because of watering or heavy rain, you may need to make staples to secure certain plants in place – cut coat hangers or other heavy wire into 4 or 5 inch lengths then shape it into a U over the end of a broom handle. One or two of these should be enough to secure your little plants. While your wall plants are getting established, they will need regular watering using a fairly fine mist. Heavy sprays of water may dislodge the plants or even wash away the soil completely. Have some extra sheet sphagnum moss handy to stuff cracks if you notice the soil is washing out. After planting, a wall may need to be misted about three times a week for a month or so – less often if you get regular rain, more often during the heat of summer. Watch for signs of wilting plants and let that be your guide.